Unless you’ve been living under a rock for the past two weeks, you’ve likely heard of the hot new app Periscope. For the last couple weeks, our CEO has been hosting live Periscope broadcasts from his office, talking about everything from his view on the newest apps to the time he took a Tesla for a test drive. On Thursday, April 16, our Talent team, whose responsibilities include building social competency within our own company, will be taking this experiment to the next level with Operation #FollowTheSun. The aim of this campaign is to introduce some of our peeps around the world, and provide a glimpse into #HootsuiteLife through their lens (well, iPhone). We’ll start in Singapore, and work our way through our offices around the world, ‘following the sun’, ending in Vancouver, affectionately called “the nest”. Below is the schedule, and for those of you who won’t be awake to see what’s in Dean’s fridge at 7AM PST, don’t worry—we’ll share the links in a follow-up blog post so you can catch his broadcast at a more reasonable hour. 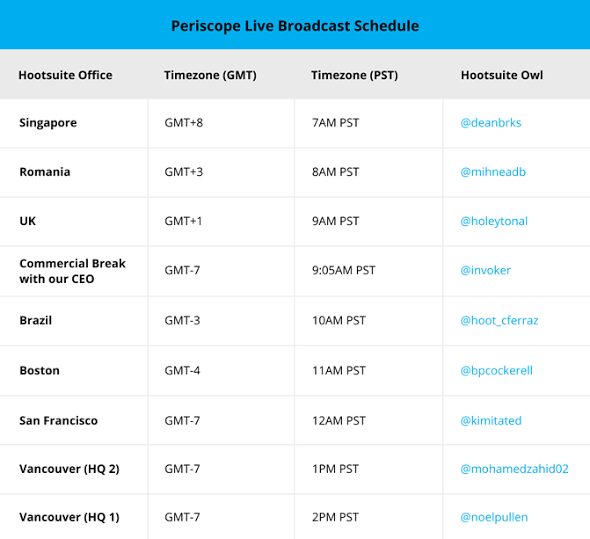 Follow @hootsuitelife to be notified when their broadcast goes live.